In a small bowl, mix soy sauce with our Palacio Blend extra-virgin olive oil, adding a touch of the Moroccan spice mix. Thinly slice the radishes. 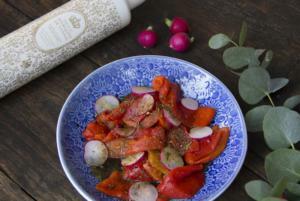 Arrange the roasted red peppers with the radish slices and dress with the sauce. An easy, original and eye-catching salad!